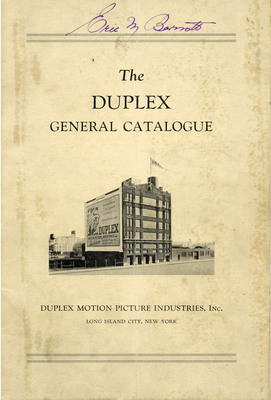 "The Duplex General Catalog, ca. 1925"
Duplex Motion Picture Industries, Inc. Catalog: The Duplex General Catalog, Duplex Motion Picture Industries, Inc., Long Island, New York, ca. 1925. Reduction printers, trick printers, sound printers, perforators, developing machines, etc. Booklet owned by Eric M. Berndt [name written on cover].